In one sense plants and algae can be considered to feed on a diet of photons of light and molecular side dishes of water and carbon dioxide. This photon diet induces a chain of biochemical reactions, termed oxygenic photosynthesis, leading to the synthesis of larger organic carbon molecules from carbon dioxide (CO2) and the production of oxygen gas (O2) from water which is returned to the air. Scientifically speaking, algae are termed photolithoautotrophs. We, on the other hand, are chemoorganoheterotrophs and do the opposite to plants and algae: we feed on organic carbon molecules which we metabolize using O2 from the air, exhaling CO2 into the atmosphere. Consequently, photosynthesis can be thought of as a biological filter system for humans, removing the CO2 waste and replenishing the air with O2. Algae have even been proposed as possible life-support systems to supply oxygen to astronauts on long journeys through space. According to the 2011 EU report ‘Promoting Actions for Indoor Air Qualities’ (IAIAQ), we spend 60-90% of our life indoors. Rising levels of CO2, especially indoors in the urban environment, has a well-documented negative impact on well-being and performance at the office and at home. Removing CO2 from the air using photosynthesis is nature’s solution to this problem. Microalgae are a most flexible form of greenery for urban indoor uses where space and soil are limited. Cultivating one of the most efficient algae, Chlorella sorokiniana, reduces CO2 levels 27 times faster than sunflower. Chlorophyll fluorescence imaging, which is a proxy for photosynthetic activity, has revealed that Printed Algae are still alive and biologically capable of capturing atmospheric CO2. Printed Algae therefore represent a convenient biofiltration device for the domestic environment, perhaps in the form of wallpaper, that is activated simply by its ambient environment: light and CO2. Growing algae is often done in liquid cultures (such as in open ponds, or closed photobioreactors) but this ‘aquarium’ system requires a considerable input of energy and water (DoE 2012), which in the case of water is a waste as most of the water is not actually consumed in photosynthesis. In contrast, Algae Printing leads to the production of concentrated layers of algal cells on a solid surface such as paper and so slims down the size of the growth vessels and reduces the amount of water and energy needed for growth. 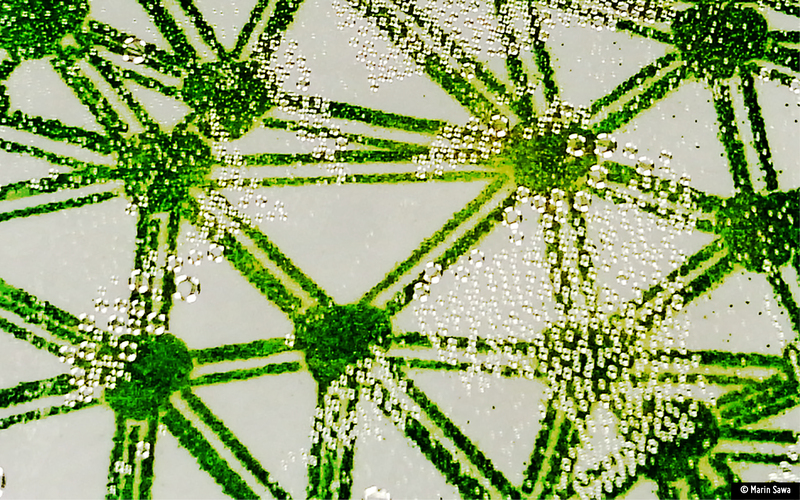 Algae Printing for solid culture brings unprecedented control and creativity to microbial cultivation, which can be patterned, mixed-cultured with precision and control, and can be installed in vertical, horizontal, diagonal orientations. Introducing a simpler way of cultivating algae as part of indoor space and environment could lead to the adoption of algae cultivation for potential home production of health food and bioenergy.